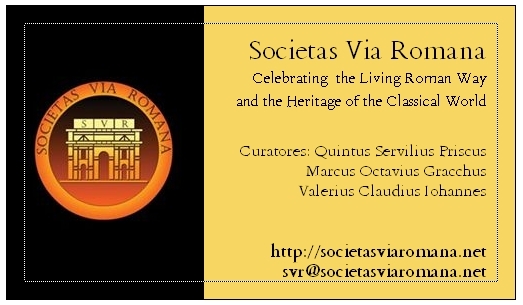 - That our participation on this day, in whichever place, will mark an international coming-together in friendship of multiple Roman societies, including the SVR, Nova Roma, The Roman Way, and other organizations devoted to the classical world. 7-9 PM - Roman Dinner at the First Unitarian Universalist Church of Austin: This dinner will include ancient recipes and a showing of a BBC presentation on Rome. I think this is also when our groups might want to "talk shop", if we didn't do it over lunch. ...and I did up some promotional items to give away at the Rally (design by Marius; produced by VistaPrint.com). Note: the dashed lines are not part of the design; they just show the available "image area" for composition purposes. ...and the commemorative postcard for the event. I've printed 250 of the former, and 100 of the latter, and I'd be happy to send some to anyone who wants to brag on us in their own neck of the woods.